This weekend reminded me of this post that I had not had a chance to finish about the “crazy” rain weather and it’s effects on the Boston area. On Saturday we were in Newton visiting Modell’s so that we could buy some sports equipment for the sports camps my children are attending. Ironically we got caught in torrential downpours similar to the ones experienced a few weeks ago that eventually were categorized as macrobursts. The Boston area will be seeing the effects of that rain storm and macroburst for some time to come. As I walk or drive around Belmont, Arlington, Cambridge, Newton and Boston I have been able to spot the tree damage even now. The picture above is one example. You walk by and have to ask where’s the rest of the tree? Since that time the many damaged trees have been taken down by local town and city DPW type of departments. 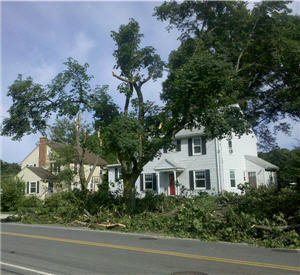 Many of the trees damaged in the storm were older trees that have been around for decades. Many towns were tight on their tree budgets as it was. It is likely that many of the trees will not be replaced. This will be bad for the environment as well as appearance of the many tree lined streets in the Boston suburbs. Given this weekends flash flooding events I would have to say we need to start getting used to this freakish weather and plan appropriately. This is truly a challenge as cities and towns struggle with their annual budgets but it is getting to the point that infrastructure needs to be updated to address the new challenges of mother nature. At points during our trip this weekend we had to double back as storm drains were literally bursting with the overflow of water.